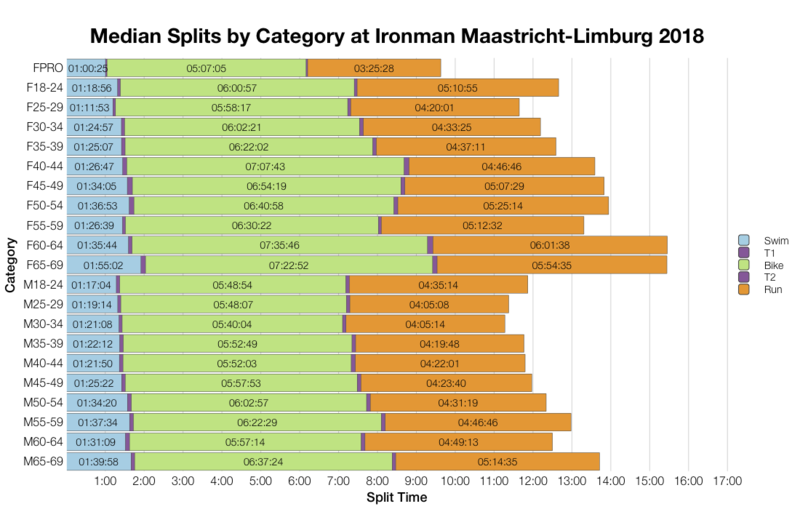 Ironman Maastricht-Limburg is the first of the two European races I’ll be analysing this week. 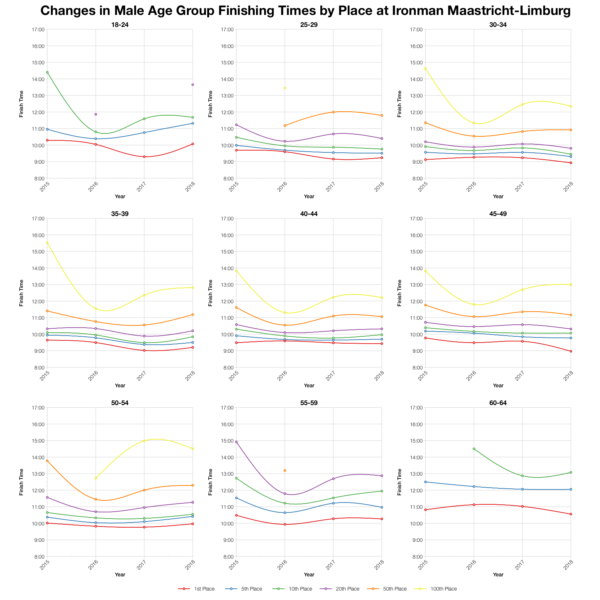 It’s a relatively new Ironman race, having been on the calendar for four years. 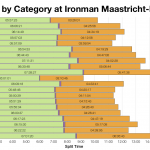 It draws a small to mid-sized field of around 1,100 athletes for the standard allocation of 40 Kona slots. 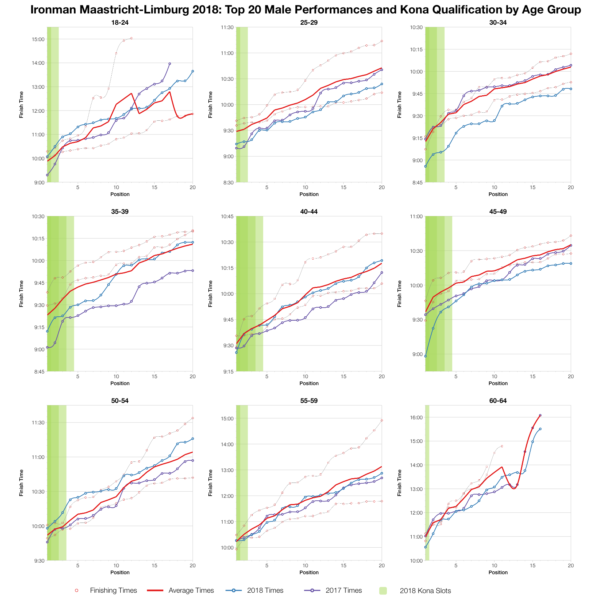 Results from Maastricht tend to trend around the average for European races. 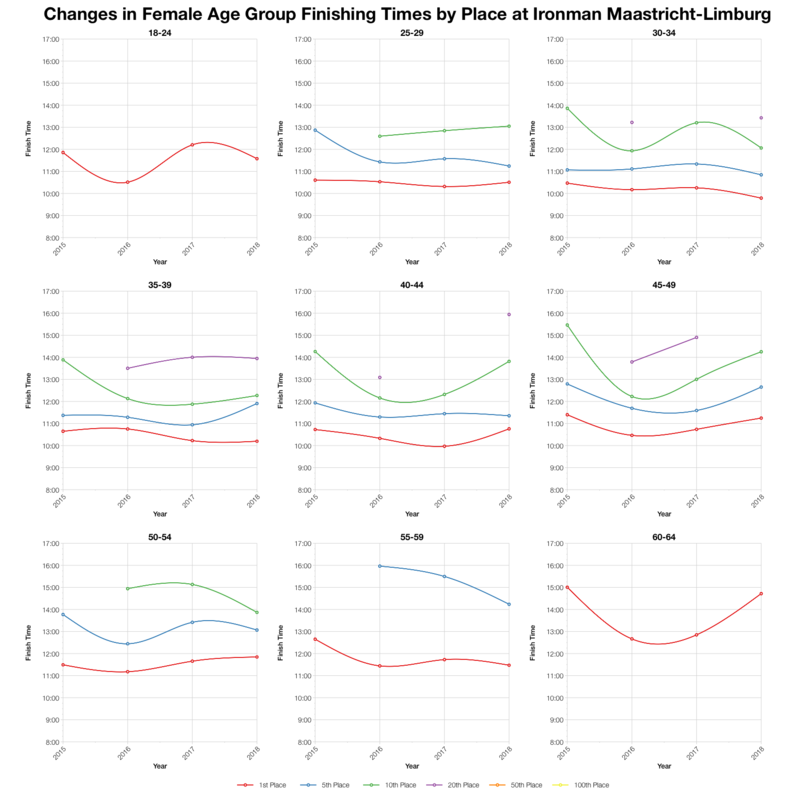 The most obvious feature of this year’s race is a much slower swim – there’s a big shift in age group times across the board with few making it under the hour. After the tough start the race followed with a faster bike, trending marginally quicker than the previous years of results. It wrapped up with a run that didn’t trend too far from the historical data. 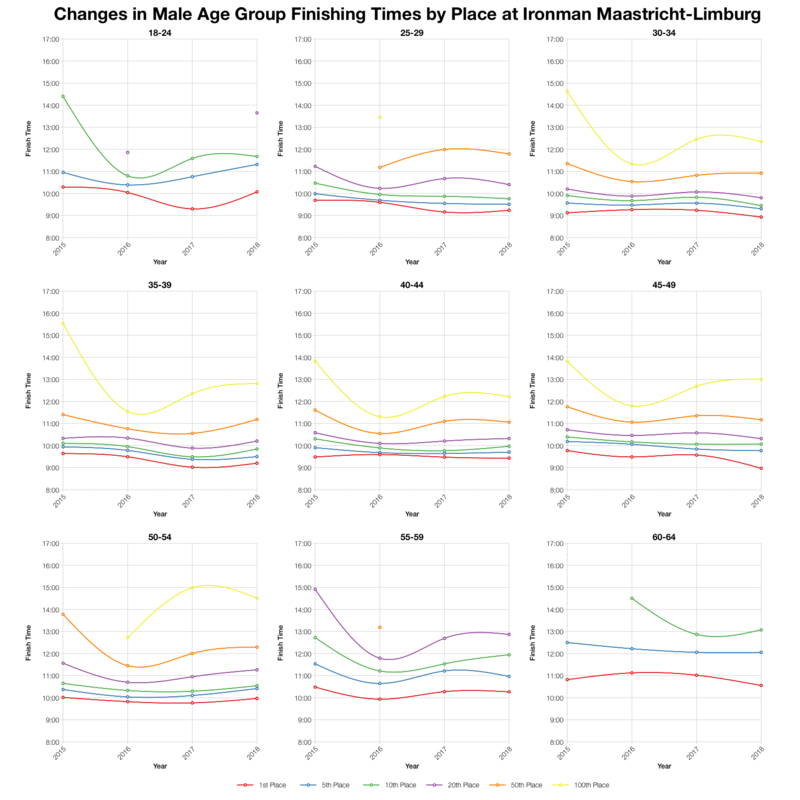 Overall the race trends slightly slower at the median, but is largely comparable further up front. Allowing for the fact that the first two years of results combine DNS and DNF numbers this year’s race is typical for the course. The inaugural year had a higher DNF rate thanks to its run, other than that the last 3 years have trended closely for drop out rates. The median trends are similar to the distributions. 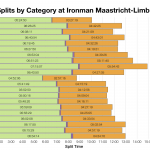 A significantly slower swim this year, generally faster bike splits and a more varied set of run medians. A broad range of mostly European nationalities at this race, with the Germans taking a big share of the Kona slots fo their numbers. After a slow start in its first year results have trended quite consistently on this course. 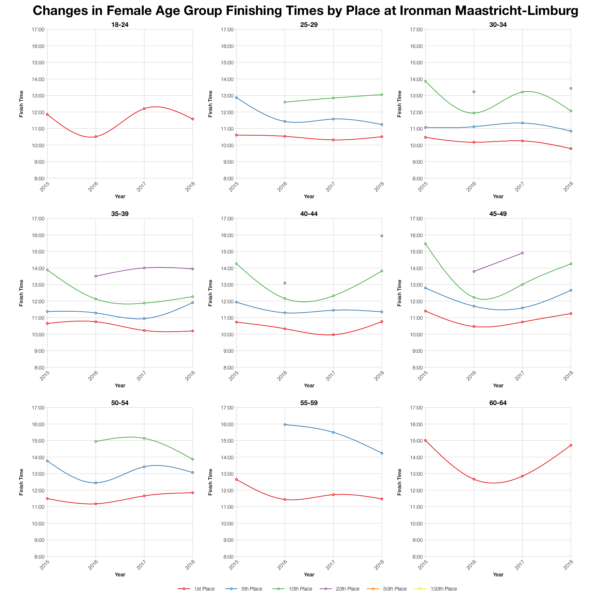 There’s variation over age groups and placings, but for the most part this year doesn’t differ too much from the last. 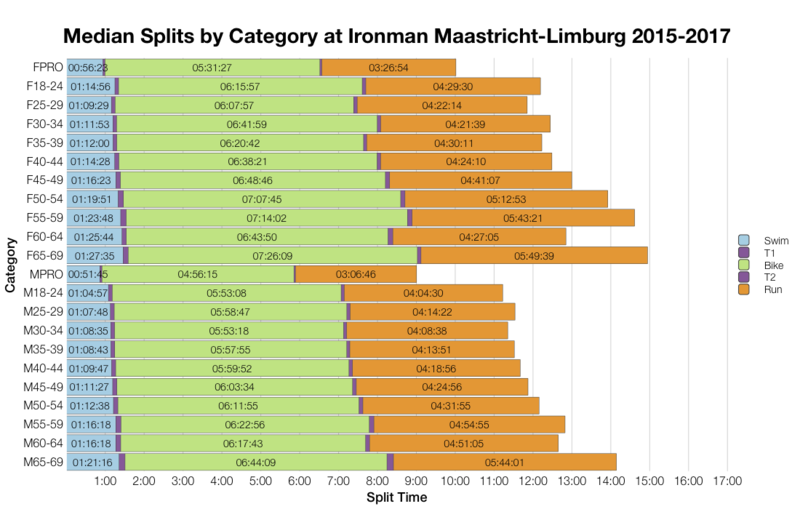 Based on the start list for Ironman Maastricht-Limburg I’ve estimated the allocation of Kona slots and what that means for automatic qualifying times in each age group. Final numbers may vary and roll down will influence the final qualifier’s time. As always, you can compare this with other races on my Kona qualification page. 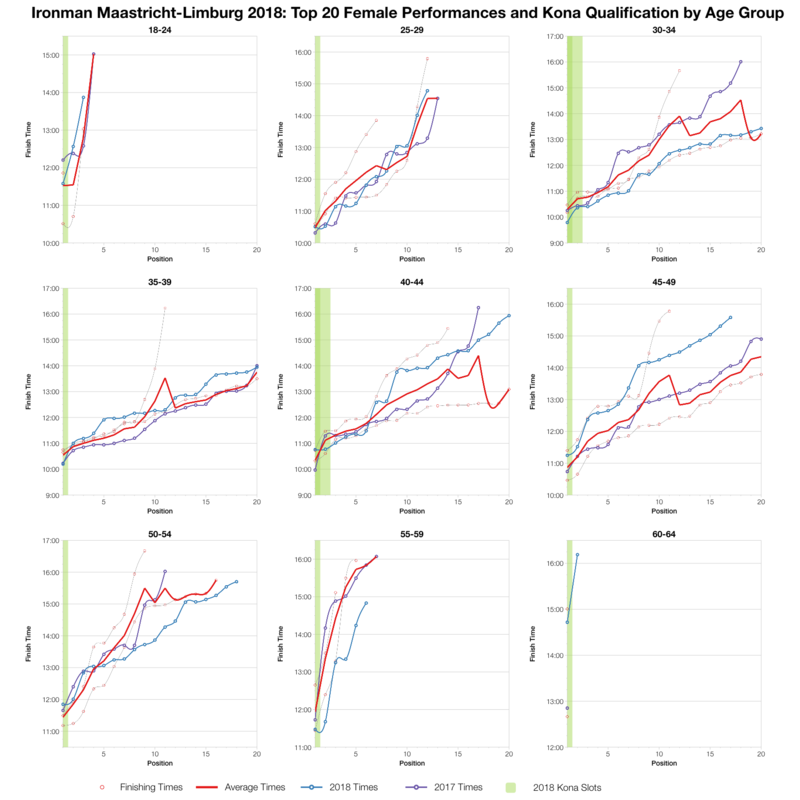 With specific exceptions the top twenty in each age group mostly tried close to the average for the course. Some a bit slower, some a bit faster, or in the case of M30-34 a lot faster. The overall picture is of a set of race results not too dissimilar to previous years on the course. 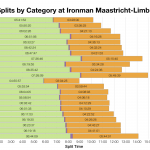 You can access a spreadsheet of the full results from Ironman Maastricht-Limburg 2018 on my Google Drive.